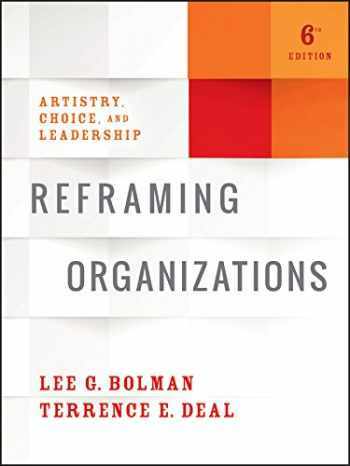 Acknowledged author Lee G. Bolman wrote Reframing Organizations: Artistry, Choice, and Leadership comprising 512 pages back in 2017. Textbook and etextbook are published under ISBN 1119281814 and 9781119281818. Since then Reframing Organizations: Artistry, Choice, and Leadership textbook received total rating of 3.5 stars and was available to sell back to BooksRun online for the top buyback price of $18.13 or rent at the marketplace. Set aside trends to focus on the fundamentals of great leadership Reframing Organizations provides time-tested guidance for more effective organizational leadership. Rooted in decades of social science research across multiple disciplines, Bolman and Deal's four-frame model has continued to evolve since its conception over 25 years ago; this new sixth edition has been updated to include coverage of cross-sector collaboration, generational differences, virtual environments, globalization, sustainability, and communication across cultures. The Instructor's guide has been expanded to provide additional tools for the classroom, including chapter summary tip sheets, mini-assessments, Bolman & Deal podcasts, and more. These recent revisions reflect the intersection of reader recommendations and the current leadership environment, resulting in a renewed practicality and even greater alignment with everyday application. Combining the latest research from organizational theory, organizational behavior, psychology, sociology, political science and more, the model detailed here provides real guidance for real leaders. Guide, motivate, and inspire your team's best performance as you learn to: Optimize group, team, and organizational structure Build a positive, collaborative dynamic across generations, teams, and sectors Understand power and conflict amidst the internal and external political landscape Shape your organization's culture and build a cohesive sense of spirit Bolman and Deal's four-frame model has withstood the test of time because it offers an accessible, compact, and powerful set of ideas for navigating complexity and turbulence. In today's business climate, leadership trends come and go; today's flash in the pan is tomorrow's obsolete strategy, but a leadership framework built on a solid foundation will serve your organization well no matter what the future holds. Reframing Organizations provides clear guidance and up-to-date insight for anyone facing the challenges of contemporary leadership.